How do you know if you will be profitable? In this episode of 2Traders Podcast, Walter and Darren present what every trader must know in order to determine likely profitability (there are no guarantees, of course, but there is a smart course of action to take). You will see what execution, testing, and verification has to do with your trading. Walter breaks it down into one simple concept, if you get this, you will be ahead of 85% of the traders out there. You will learn what this concept is and why you need to be aware of it. Also, Darren hands out two important keys to unlocking this idea (Hint: they involve a bit of math and a bit of psychology), and you will know how these two things effect your system’s profitability. There are many ways to skin a cat[Click To Tweet]. The best thing to do is to test it [Click To Tweet]. What do you want to get out of trading? [Click To Tweet]. Walter: Welcome to Two Traders. It’s Walter here. Hi, Darren. How are you today? Darren: I’m very good, Walter. Walter: We are going to talk about this idea that we we’re talking about just before we hit the record button. This is you can tell if a trader is profitable by knowing “blank”. The question basically is what’s the one thing you need to know about a trader to know how the trader is doing in terms of profitability. Do you want to take the crack out of it or do you want me to go first? How do you want it? Darren: Yeah. I mean, the thing that struck me when I first read this title for the podcast was I thought about it for awhile, what is the one element and then I thought, you really shouldn’t be concerned with whether other traders are profitable or not. If you believe they are then really, you should do your own investigation to discover why you believe that to be true. That was my first gut instinct to that question and I know that’s not really what you’re angling at. Walter: Right, yeah. That’s right. I mean, it’s an interesting take. I was thinking more like you go to the doctor and the doctor is trying to figure out if you’ve torn your ACL. They do this one test or whatever and I was thinking of it in terms of diagnostic but I see what you’re saying. You are talking more about verification of traders or something like that like should you put your faith in somebody? Darren: Yeah. And again, I find that’s really hard to put a finger on because in my experience, the most successful traders have always had edges in different places. There’s not really one collective, one thing that seems to run true for all of them. I’m sure I know now you’re going to come up with something that’s going to completely change my mind but that’s what I’m thinking at the moment. Walter: No, I’m with you. When I was thinking about this, I thought the same thing. I thought, “Hang on, I’d want to know this” and then I’d thought, “No, I want to know that”. Actually, there’s a few things… It’s kind of like when you go to the doctor and they asked you a few questions. They’re not just going to say, “Does your knee feel… Has it been swelling today?” “Yeah” “Okay, you’ve torn your ACL”. They don’t say that, right? They’ll say jiggle a little bit and they’ll see if it hurts when you do this and hurts to do that and has it been swelling. When you run, does it do this or whatever? There’s a list of questions but my idea, my thinking — my thought at least at this stage — is that if I know the likelihood of blowing up your account… So essentially, what is the risk of ruin for your trading system or even if you combine all of your trading systems that you trade? And if you combine those together in sort of one master system and you calculate your risk of ruin which incorporate things like the average winner, the average loser and the win rate, right? Those key parts of your… And the risk per trade — assuming of course that you have a constant risk per trade which we know not everyone does but assuming that that’s what you do. If you have those elements, you can spit out at least two different ways unlikelihood or probability that you’re going to hit, blow up your account, or you can change the risk of ruin form less so that it says, “What’s the likelihood that you’re going to have 30% drawdown?” Something like that. To me, knowing your risk of ruin or your risk of x percentage drawdown, to me, that’s the number one thing. The reason why I think it’s so critical is nobody knows it, nobody ever looks at this. Maybe futures traders and maybe, certainly some people who gets deep into risk like private funds and things like that, they look at things like this because they’re all looking at correlations and stuff. At least my experience has been, most retail traders do not consider their risk of ruin. It’s just not even on the radar. I would argue that that’s the most important thing to know. What is the risk of ruin, and when I say risk of ruin I also mean risk of x percent drawdown. If you, Darren, as a trader say, “You know what? If I have a 35% drawdown, I’m going to seriously consider stopping trading this system or stopping trading this market or whatever your red flag level is”. And I can say, “Darren you’ve got a 17% chance of hitting that over the next thousand trades” or whatever that’s a really important piece of information. So, I would go with that if I have to lock in one thing. What’s nice about it though, like I said, it incorporates a lot of different elements of your strategy, or strategies if you trade several strategies. Darren: Yeah, I think what you’re saying is completely true and I think best advice in a way to approach trading is from that standpoint. You really want to limit the possibilities of you blowing up as much as possible while still having good probability of making profit over the long term. That really is the best advice about how to trade but there is a lot of traders who have been really successful and have basically not taken that into account. The most obvious ones that the people probably know is in the film “Margin Call”. The trader there that was betting against the housing, the mortgage defaults, and his risk of ruin was massive there but he was right and his payoff was massive. He made a lot of money. You could also argue that he was a super successful trader and obviously that is a much more risky approach. It does go to show that there’s more than one way to skin the cat here and you really need to decide what you want to get out of trading. If you want to make a fairly safe, fairly low-risk income over the long time then a certain approach, you should adopt but that’s isn’t necessarily right for everyone. Walter: Yeah, that’s right. There are stories out there. Like, Jesse Livermore apparently had some wild swings where he went broke then he made millions, and then he went broke, then he made millions, then killed himself. There’s another, George Soros. Apparently, George Soros did the same thing with the Bank of England trade. I think it’s the Deutsche Mark against the Pound and he basically broke the Bank of England. That’s the legend. He says, “It takes courage to be a pig.” So to me, that’s like a code for, “Yeah, I really bet the house on that one”. You know what I mean? I mean, it happens. It definitely happens. I think that would make for a really interesting podcast. Maybe we can do that in the future where we’ll talk about that approach to trading. Like, how can you wall off that approach to trading and use that in your trading. But, from your point of view, is there… Because, I guess there’s sort of two questions here. The first question was the one that I was thinking of which was, what do you do or what do you want to know in order to make sure that you’re in the right track as a trader? I would argue that’s your risk of ruin or risk of x percentage drawdown and fill in the blank with the x percentage. But, your initial thoughts are interesting to me because I think you’re right like what’s the point? Why is it so critical for you to know about what another trader is doing or what another trade is capable of? Particularly, when we know — or at least I would argue — I have a strong belief that it doesn’t matter. I don’t give a rats behind how Darren trades or how Darren finds his profits because I know I can’t trade that way. Do you know what I mean? It’s the same with any guru. Any guru out there who says, “This is how I trade,” I don’t think that you should follow that guru. I think it makes sense to learn elements and maybe pieces or even just to look at that and go, “Nope, not for me”. Even that is useful. Just knowing that that’s not for you but I don’t think anyone listening to this podcast… If you have in your head this idea that you’re going to follow a guru and that’s the path to riches, I think you’re going to be sorely disappointed. Darren: Yeah, I totally agree. I think for me, more than risk of ruin, I look at it in a way of your risk and your losses are always related to your possible gains. If you want really, really small drawdowns and really small risk then that’s going to have an affect on the sort of profit that you can make. Unless you get perfect market conditions for your particular strategy and that is the least likely thing to happen that it’s always going to be the perfect market conditions for your strategy. You have to temper both sides and if your desire as a trader is to make a lot of money quickly, then you’re going to have to take on more risk. Those two, to me, are always locked. I think a lot of traders try and unlock that. They want their cake and they want to re-eat it. They want really small drawdowns. They don’t want to take much risk on but they expect really big returns. I think that is a really important distinction to make. Walter: Yup, absolutely. I think that’s the big draw — to me, I think — for those Martingale systems. People just feel like… It just feels like they’re not really risking anything because they just keep winning and winning and winning until they don’t. I think that’s right. Darren: Yeah. They’re taking on a lot of risk to get a lot of gains but the gains tend to be small wins often. You need to decide where you want to sit on that pendulum, how much risk you really want to take on. That’s why I think it’s always dangerous for people to sort of say drawdown should only be a maximum of x percent really low amount. That’s fine but you’ve got to accept that that’s going to affect your upside as well. Walter: Yeah. So, my question for you then is, where is the sweet spot there? I’m talking in general terms. I’m not talking specifics so for example, let’s say that I’m one of those traders that says — for example — the common thing is “I want my returns to be double my drawdown”. So, if I have 10% drawdown, I want to be able to try and shoot for those 20% return or whatever like that. The question is where should the focus be then? What do they focus on? Darren: I think the focus should be on how much you’re prepared to risk, how much you want to lose and then how you personally feel about it, I suppose. I mean, I know I’m always going on about Dunn Capital. They have drawdowns of 20%, 40%, doesn’t seem to bother them and they make money over the long run. When the markets place a one or two, they make huge gains and that’s something that they’re happy with. He blankly says to all of his investors that he trades for. He says, “This is how I trade. If you don’t like it then don’t put your money with me”. I always bring him up because he’s a really good example that you can’t be successful with slightly larger drawdowns. The reason he makes it works is when his trades do come off, the wins are massive but he has losing years. He has years where he makes no profit all year. So, you really need to decide where you’re comfortable and how you want to trade. Walter: Yeah. Do you think the exits are really kind of the area to focus on? Like, if I’m a trader and I say, “Look, I’m back and forth and got like 15% drawdown but my returns are only maxing at around 15, 17% too. What can I do here?” I would say probably look at your exits, but I don’t know. What would you say? Because, I mean I’m just talking like abstract here. 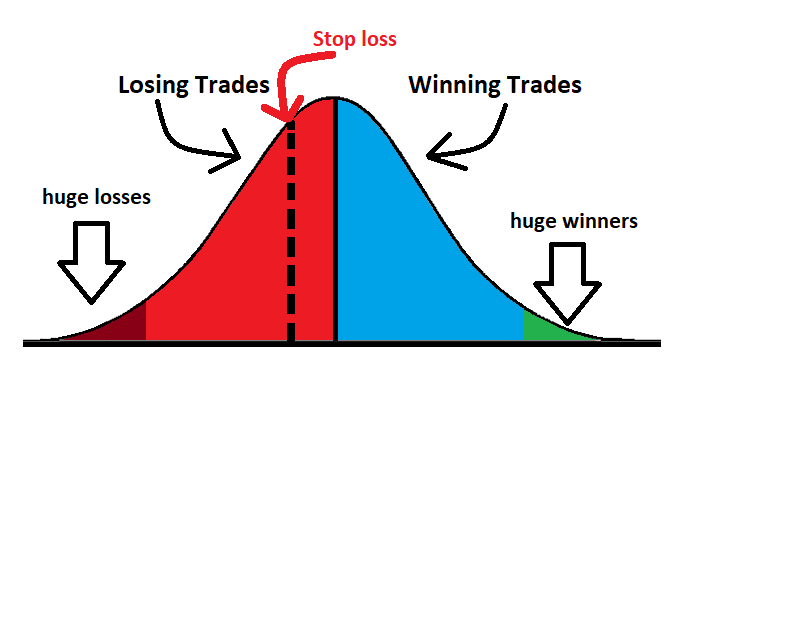 If we look at trading as like your trade result has the bell curve and on the left of the bell curve, you have all those losing trades and on the right of that bell curve, you have your winning trades. You have a few really bad losers on the far left and a few really good winners on the far right. If you have a stop loss, in theory, what you’re doing is you’re slicing off that bad — and I’ll put an image on the shownotes so you guys can see. I have a video on this because I think it’s a useful way to look at it. If using a stop loss, in theory — you should be cutting off most of those — you can always get slipped and gapped and all that but you’re cutting off most of those really bad losers. If you have some sort of open or trailing exit or way of getting out of your trades, then in theory, you should capture more of those extreme winners on the far righthand side of the curve. To me, that’s where the value is but I wonder what you think about that. Darren: I certainly believe that. I mean, everything that I’ve read on the subject in almost all study, as far as I can see if you can make sure that you have a higher risk to reward then your probabilities of making profit in the long run tend to be higher. I know a lot of people will disagree with that but all the facts point to that. It’s a case of we let our losers go too far and we don’t let our winners go far enough. Walter: So, would you say that that’s the one thing — going back to the question. If you can tell what a trader, you can tell a trader’s profit by knowing his risk/reward ratio, would you say that? I mean, that was one of my original thoughts before I decided to go with the risk of ruin. Darren: Yes. I mean, certainly if I’m a sort of a trader with 1 to 1 risk/reward and say profitable year and I sort of a trader who average 3 to 1 risk/reward and I have a trade to do well next year, it’ll be the one with the higher risk/reward. I’d be quite impressed if I saw someone with an average risk/reward of 3 to 1 over a year. That would impress me. Walter: But what if that trader only took 5 trades last year? Darren: Well, certainly trade frequency will definitely come in to it, that is a fact as well. That’s part of, like you’re saying, risk of ruin. That’s one of the important elements in that calculation. So, it is important. So, I don’t know. That’s the tricky thing and if you already use some sort of Optimal F or some sort of derivative of an Optimal F and you had such a system that had 3R for example so the average winner was 300% bigger than the average loser and let’s say 77% at a time, if you’re using some sort of Optimal F calculation for your position sizing, you’re almost be required to bet the house. Like, bet a huge chunk of your account on that type of strategy which of course means that you’re going to have massive drawdowns. Most traders can’t deal with that that’s why I keep coming back to the risk of ruin and the risk of drawdown as the key thing because from what I see, traders quit or change the game, change the system from going through drawdowns. It’s the special trader that’s able to trade out of those drawdowns. That all comes down to the Psychology. For the listeners out there, we spent a lot of time talking about Psychology. I think in some ways, what we talked about, Darren, is probably not going to be that interesting to new traders. Probably much more interesting to experienced traders because it always seems to come back to Psychology. To me, that’s what it really comes down to . It’s the experienced trader is working on himself or herself, working on his Psychology and he’s able to get through those drawdowns. The inexperienced traders doesn’t understand the risk of ruin or the math or all that stuff involved in trading and isn’t able to rely on Psychology. Whatever Psychology techniques or tricks or beliefs you have, isn’t really able to rely on those and pull out of that drawdown and come out on the other side. Darren: Yeah, I agree. I like the fact that when we talked about risk/reward, we should always think about it as average risk/reward because I think setting a fixed target on all your trades is really inefficient and it tends to make less profit. You should be looking to average over a certain amount of risk/reward but not expecting all of your trades to exit right on that mark. I’ve seen a lot of tests with random entries where a trailing stops say, maybe your average risk/reward is 3 to 1, but within that you have some trades that are 7 to 1, 8 to 1, 10 to 1 and a lot of trades that are 2 to 1 and 1 to 1 as well. In my experience, that approach is more profitable. Walter: Yeah. I know we’ve talked about this a long time ago, one of the earlier episodes about setting a weekly target. I just like to get your thoughts on that because it’s related to what you have just said which is if you have a hard target with your trade and you’re not as flexible, you’re going to miss out on something there. I think if I recall right, we were talking about this and I’ve had the same angle in my thinking in terms of weekly targets. I think the question was in that podcast something like, should you just shoot for x number of pips a week or x return a week? I thought that was a bad idea because what that meant was you would average lower than that because you’re going to have those down weeks that’s going to pull your average down. But, the other side of that is if you make your money on Wednesday, there’s chance that you’re going to give it back on Thursday and Friday. You know what I mean? So, what do you do? It’s a crazy thing, right? Darren: Yeah. It’s actually a bit of an illusion and really all you’re doing is you’re just saying, “Look, I’ve done well and I’m feeling good about it. The dread of it going pear-shape now is so much that I’m just gonna go and sit in my happy place and enjoy it.” But, the facts are I’ve been down this wormhole is that you’ve actually perform worse if you’ve set a target like a weekly target and a monthly target. I did a lot of testing on this and all my test came out that if you are to continue trading you would’ve done better than if you stop at specific target. Of course, you go down the “Okay, maybe the target is wrong and I went down that worm and tested all different targets and the results kept coming out.” That, you would’ve just been better trading your system in a way that your system is supposed to be traded. Walter: That’s very interesting. I have a theory on that and I’d like to get your thoughts on this. I believe that the reason why we want to take that break is we’ve just spent so much emotional or psychological energy on these trades and we’ve just pulled off the roller coaster and we don’t want to get that on again. Right? That’s why I think we want to give ourselves a reason to take to rest basically. What do you think? Darren: Yeah. It’s fear of future regret, isn’t it? You’re in a good place now and there’s a possibility that you’re going to have to give some of that back, likely highly. You’re going to give some of it back and you might give it all back and it’s a really destructive emotions in trading. The best thing to do is test it. Test it over a large sample with a lot of instruments and see if your belief that you’re better off stopping at certain target is true and I think you’ll find that it’s not. I totally understand it and it’s not to say that you can never do it. I mean, if you’ve got to Thursday and you’ve had a great week then there’s no real harm in taking a break. There’s never any harm in taking a break from trading specially when your emotions are heightened. There is no harm in that. Get yourself back to a level and then continue trading but specifically setting a fixed target is a less efficient way to trade. Walter: Yeah. That makes a lot of sense. Darren: It feels great. I know it feels great. There will always be exceptions to that. If the market is suddenly after a really strong move, perhaps looking like it’s going to consolidate then you can make your analysis on that. If that is part of your system then, certainly you can do that. Walter: Yeah. I think there’s a couple of issues here. One is with the question that you’ve tested which is, should I have a target and just stop trading or should I just keep trading through it? The other question is, is it a good idea to keep trading even though I’m totally, completely frazzled? Like mentally, which of course we both agree, obviously. No. It’s a good idea to take a break whenever, just like backtesting. If I’m in forex tester for four hours, I can guarantee that the last 20 trades I take are not nearly as good as the first 20 trades I took and that’s regardless of whether they worked out or not. I don’t care. I’m talking about execution. Execution is the thing that I’ve been spending a lot of time the last couple of years focusing not so much on the other stuff — but that’s besides the point. The point is if you’re getting sloppy, that can happen because of emotional issues or psychological issues. You’re getting too confident or too down on the dumps because you’re in a drawdown or whatever and that might mean it’s a good idea to take a break and step aside. Just like it’s a good idea to spend 30 or 40 minutes in forex tester at a time instead of 3 or 4 days and sit there in a dark corner. I don’t know how many people have done this. I don’t know if it’s just my little private joke but you’re ordering pizzas and your body is conforming to the chair and you’re still testing the system because you’re absolutely convinced that this is going to be the next big thing. Darren: You always have to keep in mind two things, I think of trading. One is your system’s probabilities and that is built up from testing and understanding your system and how are the drawdowns are likely to come and the winning streaks are likely to come. You build your strategy around that to minimize your risk and try to maximize your gains and then the other side of trading is in the moment. The execution and the emotion and whenever you’re trading, you need to be aware of those two things. If you start trading… I started trading small and I took four consecutive losses. Now, my emotional response to that is I want to stop trading because it’s painful and I was actually in a nice gain before it reverse and it went pear-shaped. But, at the same time, I know that the probabilities are that this happens and if I keep trading the system then the next time or whenever, it’s going to continue to run in my way and that’s why I make my profit and over the long run, that’s what’s going to make me profitable. So, I’m always checking those two things: the emotional response how I’m feeling and the probabilities and my strategy. Walter: To me, that’s the core of trading, what you’ve just said. That’s it, that’s the game. It’s so funny because if you’ll ask me 15 years ago, those two things wouldn’t even be on my radar. Darren: I did a post on the forum awhile back about drawdown and the fact that I feel that it’s always going to be more severe, more extreme than you plan or you think it’s going to be. I think you need to go with that mindset. Coming back to the question where we’re saying about what one thing is going to convince you that trader is profitable? Again, I don’t think you can generalise too much and I see a lot of traders do it. I think you’re much better positioned to approach it where you have very little control and you really need to pinpoint the exact elements that you do have control over. I see a lot of traders presuming that they can control all of the elements. I think it’s a bad mindset for trading. Walter: Yeah, that’s right. It sounds a cliche but that’s what you hear athletes talk about, “I only concentrate on what I can control,” and it’s the same in trading. You’re going to be faced with these issues which are basically, you’ll have the sphere of failure. These things pop up when you have rough patches but really it comes down to focusing on what you can affect, what you can adjust to, and what you are in control of. All the rest of it, you have to just to learn to let go. That’s the critical part here. Alright, to wrap up on this, Darren, I‘m going to say yeah, I’m gonna go with the risk of ruin. It’s the thing that if I have to hang my hat on one thing to decide on how a trader is going to do or is doing, it would be the risk of ruin or the risk of drawdown for that trader’s systems. And, we both agree that probably it doesn’t make a whole lot of sense to try and justify or verify what’s knowing that you’re going to trade your beliefs anyway. It doesn’t make a whole lot of sense trying to figure out if so and so is doing x this, x that or whatever. It’s really what comes down to is you… And even though we sometimes get sucked into systems because we think a trader is really good or the system is really great, the fact is we’re never going to trade that same way that other trader does. We just won’t. It’s just not going to happen because we trade our own beliefs so, that’s another thing to be aware of. Any closing thoughts on your end? Darren: I’m going to have to go with what you’ve said earlier, Walter. I think the best advice is to look at risk of ruin. It is probably the most important calculation that you can make and, like you say, a lot of people do not look at it. Walter: Alright, guys, thanks for spending time here with us and we will see you in the next episode. Thanks a lot, Darren. See you next time. Darren: Okay. See you next week, Walter.